The orchestration engine is the heart of the whole system. Its responsibility is to listen to ZooKeeper events (coming from the glu agents), compute the delta and orchestrate the deployment plans. Currently the orchestration engine is bundled with the console and is not running as a separate process. Please check the console documentation regarding installation and configuration. The role of the tracker is to listen to ZooKeeper events. Under the cover, the tracker uses ZooKeeper watches. This makes the tracker very leightweight and efficient as it receives notifications only when something changes in the system. From the information collected (and updated real-time) by the tracker, the orchestration engine can compute the live model. The information displayed here is exactly what the tracker has captured from ZooKeeper. In this screenshot you can even see how the script running on the remote agent has detected a failure and reported it. Thanks to ZooKeeper watches, the failure is propagated real-time and made available so that the user can fix the problem. "error": "Server down detected. Check the log file for errors." The static model is an input to the orchestration engine. It describes the state of the entire system (for a given fabric). The static model gets loaded in the orchestration engine either from the console web application, REST api or command line (-m option). Once loaded, the static model remains the current model until a new one is loaded. Check out the separate entry about the static model for more information. The delta service is in charge of computing the delta between the live model and the static model. As mentionned previously, the static model used is the latest one that was loaded (or selected as current). The live model is coming from the tracker. The delta is the result of the computation done by the delta service. The delta is fed into the visualizer and/or the planner. At this moment, the delta is an internal concept not directly available but as it is driving the visualizer and planner, you have the ability to see different representations of it. The planner is in charge of turning the delta into a deployment plan. 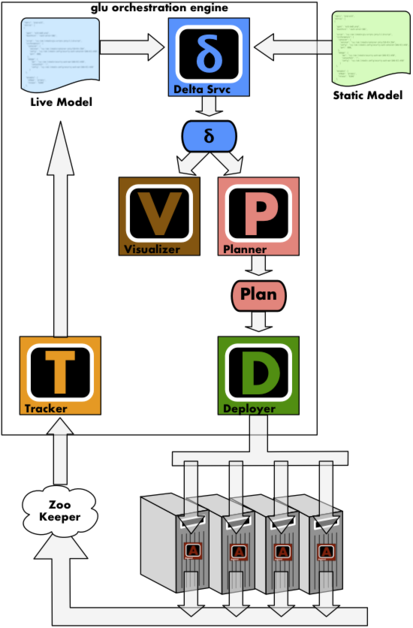 The deployment plan is the set of instructions (generated by the planner) which can be fed to the deployer in order to fix the delta computed by the delta service. The idea is that if all instructions get executed successfully, then there won’t be any delta anymore. 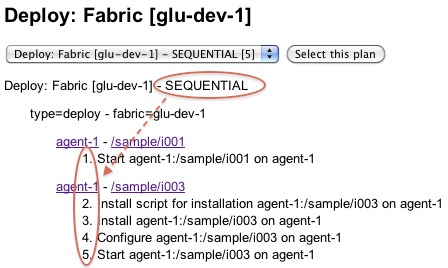 An instruction is (usually) a call (using the secure REST api) to an agent to perform a particular action (as described in the section “glu Script Engine”). As mentionned in the What is glu? section, the plan is never executed unless you give your explicit approval. Using the same delta you could visualize on the dashboard, the planner can compute various plans depending on what you instruct it to do. the numbers in front of each instruction show you in which order they will be executed. A parallel plan will execute much faster than a sequential plan since the instructions will run in parallel so you don’t have to wait for previous instructions to complete. In a sequential plan, an error in an instruction will abort the entire remaining of the plan. 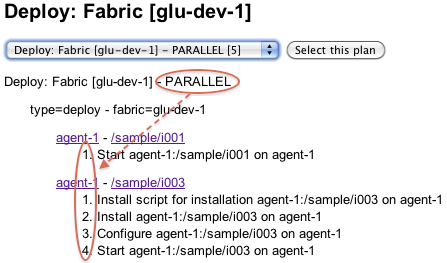 <plan name="origin=rest - action=deploy - filter=all - SEQUENTIAL" fabric="glu-dev-1"
<plan name="origin=rest - action=deploy - filter=all - PARALLEL" fabric="glu-dev-1"
The -n option means dry-run and it allows you to display the deployment plan instead of executing it! as you can see on the screenshot, every running action can be cancelled in the event there is a need for it. The orchestration engine offers a REST api (served by the console webapp). You do not have to use the REST api directly: there is a convenient command line interface (cli) which is already using it. You would use the REST api directly, in cases when the cli is not enough or you want to have more control for example. The username and password are only slightly obfuscated (base 64) but it is not an issue because the cli talks to the console over https and as a result the headers are never traveling over an insecure channel. You can change the way authentication and authorization are handled entirely by writing your own plugin! You may wonder what is the difference between the 3 notions exposed by the REST API: plans, current deployments and archived deployments. Currently a plan only lives (for a short time) in memory, between the time it gets created (POST /plans) and the time it gets executed. There is no persistent storage. this may change in the future as it would be convenient to create a plan just once and execute it at a later time or repeatedly. The current deployment lives in memory because it is used by the orchestration engine to execute the steps that needs to happen. It is dynamically updated as steps complete. The current deployment will remain in memory (even after it completes) until either you shutdown the console (so the memory is gone...) or you archive it. The current deployment contains more details than the archived one and can be seen in the console when clicking on the Plans tab. 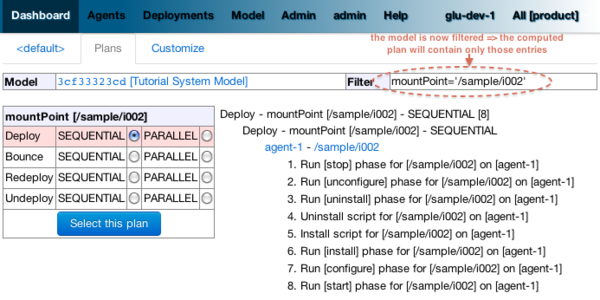 The archived deployment is created (in the database) when the plan starts executing and then it is updated again only when the current deployment completes (whether it was successful or not). The archived deployment is permanent (because it is stored in the database) and can be seen in the console when clicking on the Plans/Archived tab. Currently, the /plans* APIs are only dealing with the plans that have been created through the REST API. The plans created and executed from the web interface use a different mechanism and won’t appear in those calls. This will be adressed in an upcoming release. The /deployments* calls work whether the REST API or the web interface was used. curl -v -u "glua:password" "http://localhost:8080/console/rest/v1/glu-dev-1?prettyPrint=true"
curl -v -u "glua:password" -X PUT "http://localhost:8080/console/rest/v1/glu-dev-3?zkConnectString=localhost:2181&zkSessionTimeout=30s&color=%23ff00ff"
curl -v -u "glua:password" -X DELETE "http://localhost:8080/console/rest/v1/glu-dev-3"
body: json map where key is agent name and value is another map with all the agents properties (as can be seen in the console when looking at an individual agent and clicking View Details ). curl -v -u "glua:password" "http://localhost:8080/console/rest/v1/glu-dev-1/agents?prettyPrint=true"
curl -v -u "glua:password" "http://localhost:8080/console/rest/v1/glu-dev-1/agent/agent-1?prettyPrint=true"
Description: This call should be used in the scenario when you want to decommission a node: all data stored in ZooKeeper in regards to this agent will be wiped out. 409 (CONFLICT) if the agent is still up and running! curl -v -u "glua:password" -X DELETE "http://localhost:8080/console/rest/v1/glu-dev-1/agent/agent-1"
curl -v -u "glua:password" -X PUT "http://localhost:8080/console/rest/v1/glu-dev-1/agent/xeon/fabric?host=127.0.0.1"
curl -v -u "glua:password" -X DELETE "http://localhost:8080/console/rest/v1/glu-dev-1/agent/xeon/fabric"
curl -v -u "glua:password" "http://localhost:8080/console/rest/v1/glu-dev-1/agents/versions?prettyPrint=true"
curl -v -u "glua:password" "http://localhost:8080/console/rest/v1/glu-dev-1/agents/versions" --data "agents=agent-1&agents=agent-4&version=3.1.0&coordinates=https://github.com/downloads/linkedin/glu/org.linkedin.glu.agent-server-upgrade-3.1.0.tgz"
curl -v -u "glua:password" "http://localhost:8080/console/rest/v1/glu-dev-1/plan/49e69ef4-7c84-4f9b-9838-fce131b69028?prettyPrint=true"
Description: List all the plans (that have been created through POST /plans). curl -v -u "glua:password" "http://localhost:8080/console/rest/v1/glu-dev-1/plans?prettyPrint=true"
201 (CREATED) with Location header to access the plan execution (/plan/<planId>/ execution/<executionId>). it is a non blocking call and it returns right away and you can check the progress thus allowing to have a progress bar! Description: List all the plan excutions. Once a plan has been created (POST /plans) it is possible to execute it multiple times. This call allows you to list all the executions of a previously created plan. curl -v -u "glua:password" "http://localhost:8080/console/rest/v1/glu-dev-1/plan/03714d11-7b44-4717-b426-85d4cbf6c5d4/executions"
Description: Return the status of the execution. Description: Return the execution as an xml document. Description: List all current deployments. curl -v -u "glua:password" "http://localhost:8080/console/rest/v1/glu-dev-1/deployments/current?prettyPrint=true"
Description: Archive all current deployments. curl -v -X DELETE -u "glua:password" "http://localhost:8080/console/rest/v1/glu-dev-1/deployments/current"
curl -v -u "glua:password" "http://localhost:8080/console/rest/v1/glu-dev-1/deployment/current/1?prettyPrint=true"
Description: View the current deployment info (just the headers). curl -v --head -u "glua:password" "http://localhost:8080/console/rest/v1/glu-dev-1/deployment/current/1"
Description: Archive a single current deployment. curl -v -X DELETE -u "glua:password" "http://localhost:8080/console/rest/v1/glu-dev-1/deployment/current/1"
Description: Return the total count of archived deployments. curl -v --head -u "glua:password" "http://localhost:8080/console/rest/v1/glu-dev-1/deployments/archived"
Description: List archived deployments according to the parameters provided to determine which page to return. curl -v -u "glua:password" "http://localhost:8080/console/rest/v1/glu-dev-1/deployments/archived?prettyPrint=true&max=2"
curl -v -u "glua:password" "http://localhost:8080/console/rest/v1/glu-dev-1/deployment/archived/1?prettyPrint=true"
Description: View the archived deployment info (just the headers). curl -v --head -u "glua:password" "http://localhost:8080/console/rest/v1/glu-dev-1/deployment/archived/1"
Description: Retrieve the current loaded model (aka expected state) if no id specified, otherwise the specified model. curl -v -u "glua:password" "http://localhost:8080/console/rest/v1/glu-dev-1/model/static?prettyPrint=true"
Description: Return the total count of static models. curl --head -u "glua:password" "http://localhost:8080/console/rest/v1/glu-dev-1/models/static"
headers: X-glu-max, X-glu-offset, X-glu-sort, X-glu-order, which are the values provided/defaulted/adjusted from the request and X-glu-count which is the number of entries returned and X-glu-totalCount which is the total number of models. X-glu-current contains the id of the currently selected model (which may not be on the page returned). curl -v -u "glua:password" "http://localhost:8080/console/rest/v1/glu-dev-1/models/static?prettyPrint=true&max=2"
Description: Retrieve the current live model coming from ZooKeeper (aka current state). curl -v -u "glua:password" "http://localhost:8080/console/rest/v1/-?prettyPrint=true"
curl -v -u "glua:password" "http://localhost:8080/console/rest/v1/-/agents?prettyPrint=true"
This api (/rest/v1/-/agents) which returns a map of association agent -> fabric should not be mistaken with the api /rest/v1/<fabric>/agents which specifies the fabric and list all agents in a given fabric! Once a command has been started, this api will retrieve the result(s) and optionally wait. If you request more than one stream, then you will get a muliplexed stream of results (the format is fairly simple and you can take a look at the java code on how to demultiplex it. TODO: add python code for demultiplexing/example). curl -v -u "glua:password" "http://localhost:8080/console/rest/v1/glu-dev-1/command/13b05a27b80-d527ccf3-166a-4986-90b2-41be8c2ba536/streams?stdoutStream=true"
curl -v -u "glua:password" "http://localhost:8080/console/rest/v1/glu-dev-1/command/13b05a27b80-d527ccf3-166a-4986-90b2-41be8c2ba536/streams?stdoutStream=true&exitValueStream=true"
headers: X-glu-totalCount which is the total number of audit log entries. headers: X-glu-max, X-glu-offset, X-glu-sort, X-glu-order, which are the values provided/defaulted/adjusted from the request and X-glu-count which is the number of entries returned and X-glu-totalCount which is the total number of audit log entries. 204 (NO CONTENT) when there is no audit log entries (which should not happen). curl -v -u "glua:password" "http://localhost:8080/console/rest/v1/-/audit/logs?prettyPrint=true"
This api (/rest/v1/-/audit/logs) does not reference a fabric because the audit log is not fabric dependent. planAction=stop is equivalent to planType=transition&state=stopped. The planType notation is more generic and should be used when using your own state machine or creating your own custom plan types (in which case you can also pass as many parameters as you want). maxParallelStepsCount only makes sense when order is set to parallel. Setting this value to 1 is equivalent to defining order=sequential. The orchestration engine offers a plugin mechanism which allows you to hook into some specific phases to tweak and/or change the behavior. For example, the UserService_pre_authenticate hook allows you to bypass entirely the login/authentication mechanism that comes built-in and instead provide your own. A plugin is simply a class with (groovy) closures, each of them defining a specific hook. You can define as many or as little of those closures as you want and you can spread them accross different classes (for example, you can have a plugin class handling only the deployment related plugin hooks, and another handling the hooks for a different part of the system). If a closure is missing, then it will simply not be called. The class DocumentationPlugin is meant to be an hexaustive list of all the hooks available as well as a documentation on how to use them. It also serves as an example of how to write a plugin! classPath is a list of URIs containing the various jars comprising your plugin (base class + dependencies). For full documentation and typical use cases, refer to the class DocumentationPlugin. Now that the plugin mechanism is in place, adding new hooks is not very complicated. If you have specific requirements for a new hook, please open a ticket on the glu ticketing system. The cli currently requires python 2.6 to run. The orchestration engine cli is currently called console-cli because of the fact that the orchestration engine is currently running inside the console. Url to glu Console for the given fabric. Password. Warning password will appear in clear in ps output. Use only for testing. Perform action on all instances in parallel. Default is serial. Do a dry run of your plan. No changes will be made. Default is false. Filter in DSL sytax for filtering the model. Applicable only with ‘status’ command. See Filter syntax. Filter file with filters in DSL sytax for filtering the model. Applicable only with ‘status’ command. See Filter syntax. Show current model instead of expected model. Applicable only with ‘status’ command. How do you install a plugin?